Determined and at times seemingly desperate to differentiate itself from its early morning rivals, TEGNA8’s Daybreak has notably ramped up its “social media” content without much regard for the overall nutritive value. As previously posted, the arrival of Twitter/Instagram maven Demetria Obilor as traffic anchor serves to accelerate that process as part of an overall TEGNA corporate initiative. Obilor, who started on Monday, Oct. 23rd, doubled as Daybreak’s “Speed Feed” presenter on Wednesday’s program, which I watched in its entirety to get the new lay of the land. Perhaps mystifying some of the show’s demographically “undesirable” older viewers -- and maybe a few younger ones, too -- Obilor said during the 6 a.m. hour’s Speed Feed, “Love ‘em or hate ‘em, get those emojis poppin’.” The reference was to the Kardashians’ newly signed five-year deal with the E! Entertainment network, which will pay them $30 million annually. Emojis, some of which Daybreak displayed at the bottom of home screens, are those little Twitter symbols for happy, sad, etc., etc. Daybreak also deploys the recently hired Janelle Brandom as its “social media anchor.” She likewise received ample air time Wednesday, presiding over a pair of social media polls that have no scientific basis or accuracy but are designed to keep any participating viewers tuned in to see if their Twitter or Facebook comments might be shown on-air. Imagine the excitement. Daybreak, which currently ranks third in the early morning news ratings behind Fox4 and NBC5, is plunging into the Twitter/Facebook/insta-poll deep end while also retaining a few staples such as frequent weather and traffic updates and repetition of live stories from the field. On Wednesday’s show, Hannah Davis recycled the latest news in the tragic Sherin Mathews case in four live dispatches in front of a makeshift memorial in memory of the three-year-old. What mostly stood out, however, was the time devoted to detailing and conversing on social media polls and supposedly “trending” topics. “Join us to react to the show!” viewers were encouraged in print. It seemed to be as much a plea as a come-on, in part because some of the Twitter reactions were repeated from segment to segment (giving the impression there hadn’t been enough new ones coming in). Obilor for the most part presided smoothly over both her traffic and social media venues. But she did twice misstate that Highland Park native and Los Angeles Dodgers ace Clayton Kershaw had struck out 10 Houston Astros in Game 1 of the World Series, even though both co-anchor Ron Corning and a Twitter respondent had the correct total of 11 throughout the show. 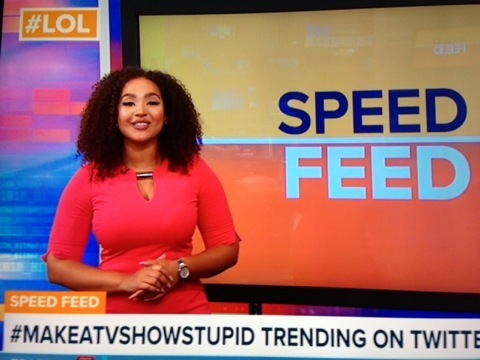 During the 5 a.m. hour, Obilor, Corning and co-anchor Alexa Conomos spent an undue amount of time chewing over a “trending” Speed Feed Twitter item with the hashtag MakeATVShowStupid. Examples included “Lame of Thrones, Big Bangs Theory” and “Bewitless” (for Bewitched). “We call this ‘Daybroke’ already,” Corning quipped while Obilor proclaimed herself a”huge, huge” Game of Thrones fan who felt offended by the “Lame of Thrones” tag. And so on. Daybreak crew member “Larry” was brought on camera briefly to give Einstein’s wisdom a thumbs up -- with his cast-bound broken hand. Obilor noted that someone once said, “The only person that doesn’t have problems is a dead person.” Which in fact is hard to dispute. For the record, Brandom’s two social media polls went like this. In light of Republican Sen. Jeff Flake’s denouncement of President Trump and decision not to run for another term, 82 percent of respondents said the GOP had changed for the worse and 15 percent for the better. Just 3 percent still weren’t sure. And had the Denton Independent School District made the right decision in keeping a student away from a homecoming dance because he hadn’t filled out the proper “forms” beforehand? At last count, 71 percent had sided against school officials and 29 percent thought otherwise. As it stands now, there are too many social media-fueled empty calories on Daybreak, which even packages reporter Sean Giggy’s feature stories as “Giggybytes.” Veterans Corning and Conomos basically are required to play along while longtime early morning meteorologist Greg Fields kept his distance Wednesday and didn’t join in any of the reindeer games. Fields oftentimes must wonder what’s hit him during the nearly 20 years he’s watched a passing parade of Daybreak news and traffic anchors -- and formats. But never more so than at the moment. If Obilor and Brandom represent yet another new dawn, then Fields is the cloud cover. “Morning Meteorologist at WFAA-TV is what I do, not who I am,” Fields says tellingly at the top of his Twitter feed, which has 1,281 followers. In contrast, Obilor has 30,369 and so far has tweeted 17 times within the past 24 hours. I think we know where the power lies.